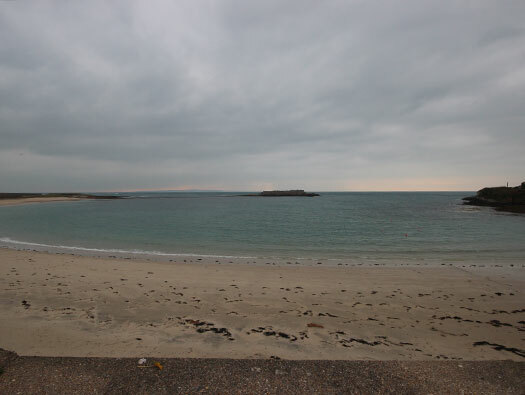 The long sweep of Longis bay, one of the main areas where before the harbour was built on the north side, most arrivals and departures happened from here. 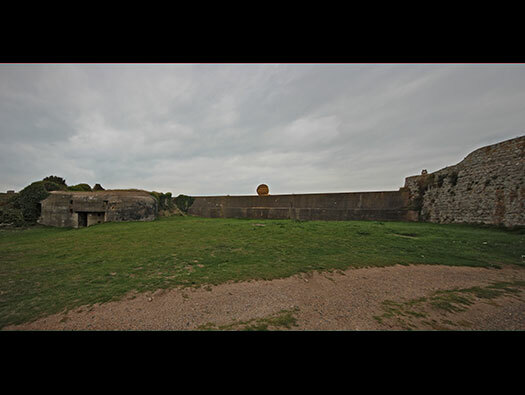 So it was an important place to defend, it already has a fort defending the bay Wn Eilandfeste, Fort Raz. Combining two 10.5cm guns in casemates on the island, the two 4.5cm Pak's, a 10.5cm and an M19 5cm mortar covering this area in two Wn's Piratenschloss & ‘Steinbruch’. 1 x 4.7cm Pak bunker. 1 x R501 personnel shelter. 7 x Machine guns (or more). 2 x 4.7cm Pak K 36(t). 1 x large Panzermauer PzM 1. 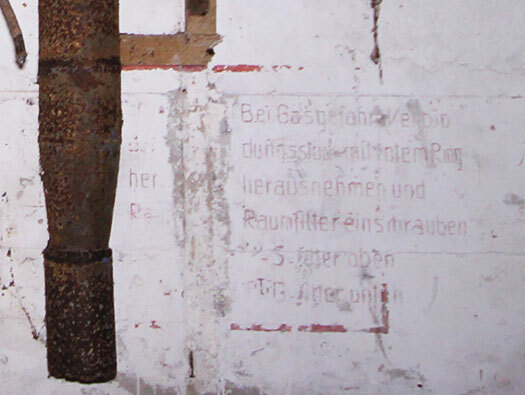 (Anti-tank wall). Wn Piratenschloss the Nunnery, built on Roman foundations, extended for the Napoleonic wars. Now a nice private house. 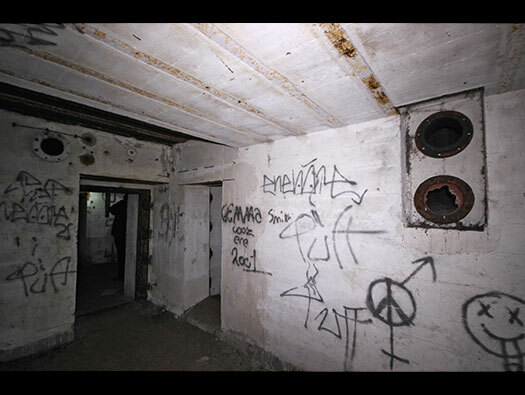 Inside the Fort is an R501 bunker. A machine gun position covering the rear and lovely herringbone stone work. Another machine gun position at the rear. Alderney, Wn Piratenschloss Searchlight garage. Searchlight garage and a closer look at the entrance. It looks as though the garage at a later date the was not needed so most of the gap has been filled in. 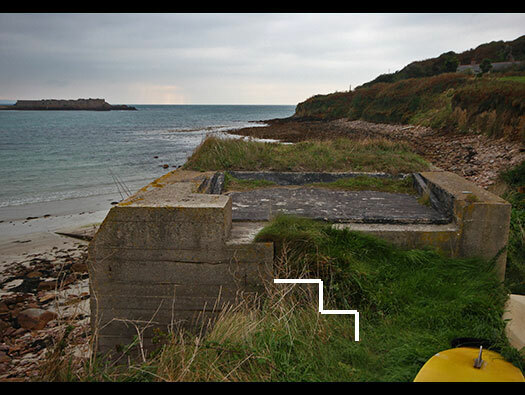 The searchlight would be pulled across the now car park to its emplacement. Black line is where a small roadway took it to an emplacement. Alderney, Wn Piratenschloss 4.7cm Pak K 36(t). The 4.7cm Pak K 36(t) casemate from behind and it looks as though there are steps to get up on to the roof. Checking up on this model bunker there seems to be on most of them a set of steps up to the roof. 4.7cm Pak K 36(t) casemate. I believe the wooden door is original?? Something I cannot see in this bunker is a slit which should be for the gun commander to look through?? Looking at other 4.7cm casemates there seems to be two types. You can see a viewing slit and the gun commander. The gunners view of the bay. 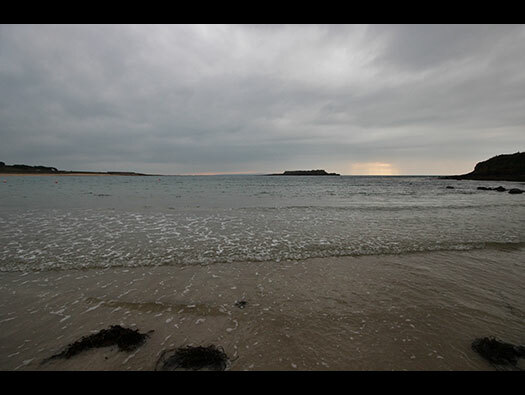 Longis Bay with Wn Eilandfeste, Fort Raz in the distance. There were many beach defences. The square tank about 3meters deep is a space to receive fired cannon shells. The shell and case attached goes into the guns breach and fired. The shell is ejected from the breach and into a tube and trough the outer wall into this tank. When the battle I presume quietened down then the tank could be empted. The tube at the rear of the gun. The empty shell cases ran down the tubing into the tank. The shell cases entering the tank. 770P4 plate. There would have been a ball and socket type joint that the would be locked into the 770P4 plate and the gun could swivel up, down, left & tight and the guns barrel being almost part of the ball joint meant that even a direct hit by a small/medium round could not even dent it. The ball joint and short barrel. 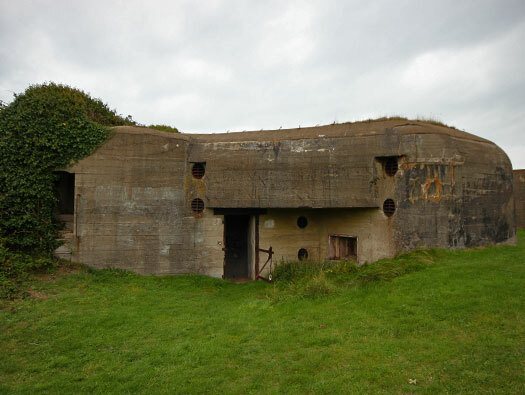 The defences along the front of &#8216;Piratenschloss&#8217; with an observation and within it a light signal to the fort on the island and three machine guns. Blinker lamp that could flash messages using Morse code. Concreted up entrance from the fort. 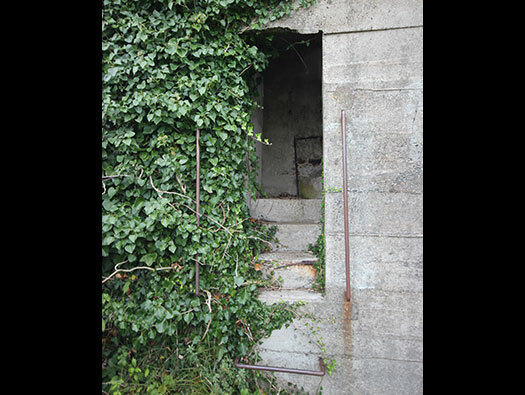 Continuing on to the Panzermauer PzM 1, (Anti-tank wall) with Machine guns and a Pak bunker (more later about this casemate). Panzermauer PzM 1, (Anti-tank wall) and the Pak bunker. 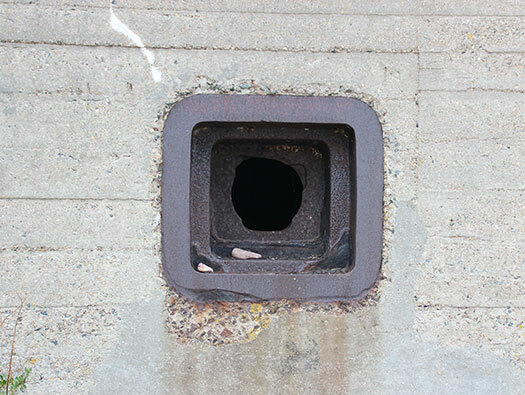 Showing the Pak casemate and machine gun embrasure. 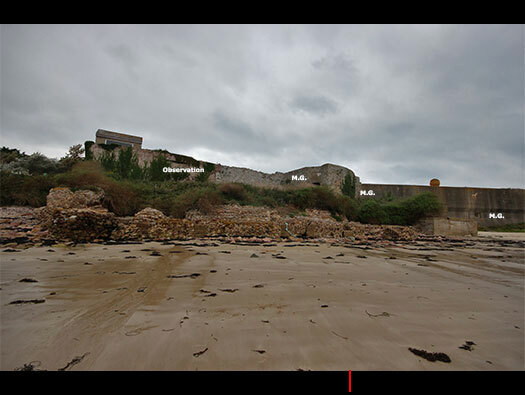 Alderney, Wn Piratenschloss R631b casemate. A larger casemate for the second 4.7cm Pak K 36(t) gun. 4.7cm Pak K 36(t) gun. 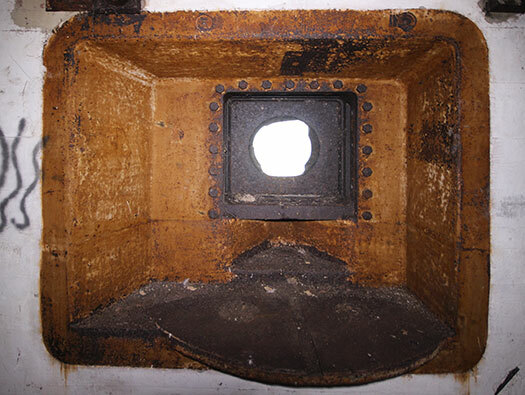 This embrasure uses the same gun as the last casemate but this one has a steel shutter to cover the gun barrel if under attack. 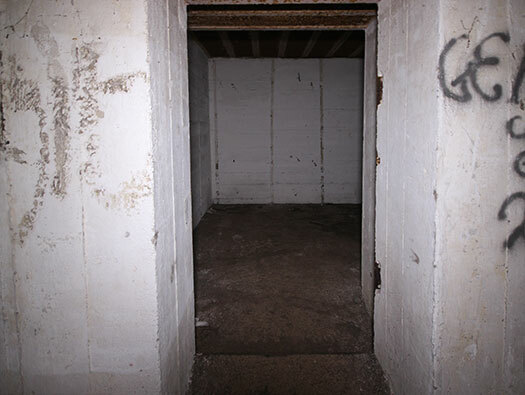 There is more about this casemates inside a bit later here when we go around behind the wall. 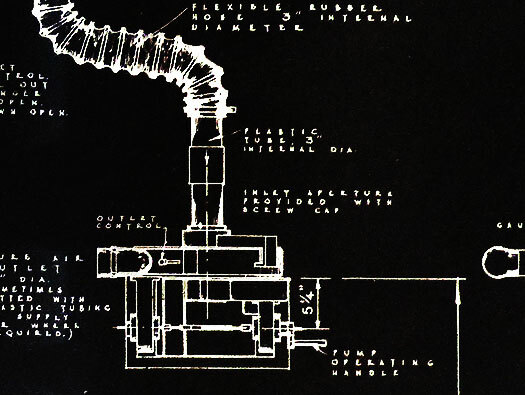 The 4.7cm Pak K 36(t) gun in position and the winding gear to lower and higher the shutter. The shutter starting to rise. Starting to cover the gun. 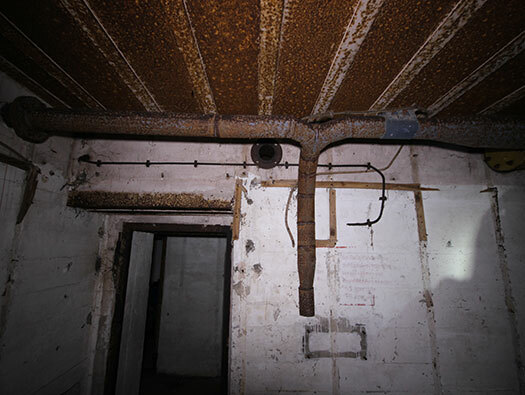 The inside of the embrasure showing the winding gear and pulley system. Now I was watched all the time buy this dog, not once did he/she smile. Close up of the walls concrete. Concrete camouflage. There is quite a lot of concrete with local stone used as camouflage and also added as strengthening. Observation and & signal light to communicate with Fort Raz. Signal light to communicate with Fort Raz. We now go around the back of the wall. The R 631b on the left and the old fort on the right. The round thing on the wall is called ART??? Looking along the roof of the bunker and the camouflage net hooks protruding from the concrete. That dog is still looking at me. Camouflage netting on a bunker. 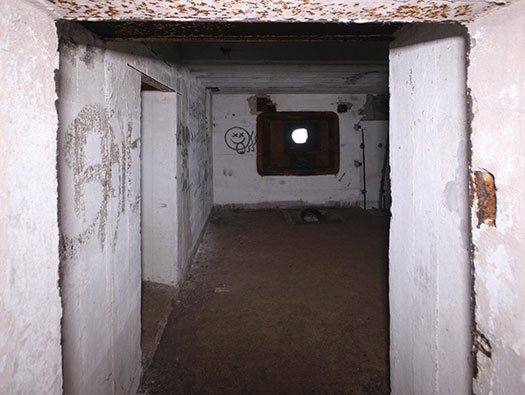 R631b casemate for a 4.7cm Pak K 36(t) with a Tobruk entrance on the left, then the main entrance to the bunker, on the right a close combat defence embrasure for machine gun to cover the entrance, Six air vents of 200mm. 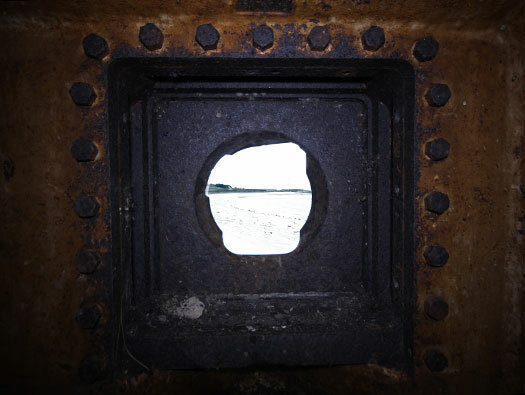 The Tobruk acted as a 306° lookout , a machine gun to defend itself and also air defence. 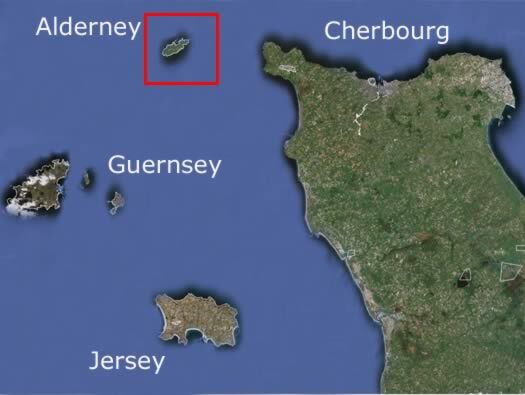 Alderney, Wn Piratenschloss R631b Tobruk. 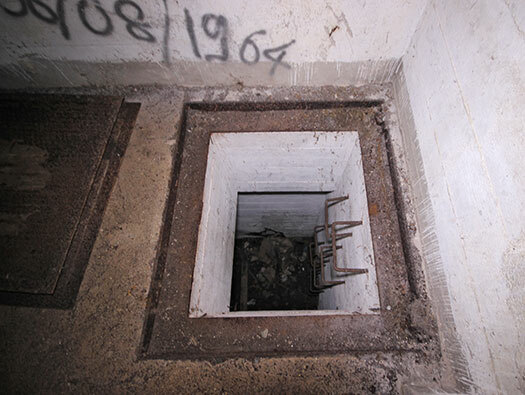 The Tobruk entrance with steel ladder up to the steps and two steel hand rails either side. The view up into the Tobruk. The niche is for a speaking tube or field telephone. This niche has a connecting box to a field telephone. Sprachrohr mouthpiece, another would be inside and then communication could be by speaking tube or field telephone. The view over the rim towards the sea. 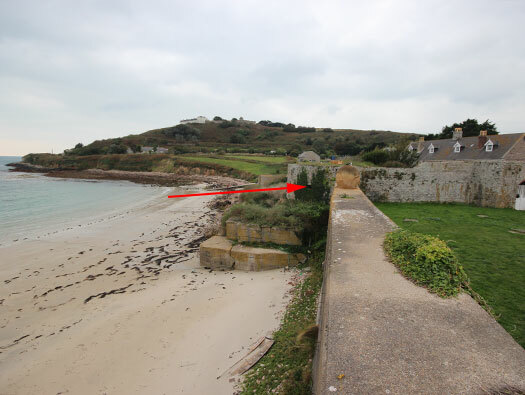 Alderney, Wn Piratenschloss R631b close combat defence. 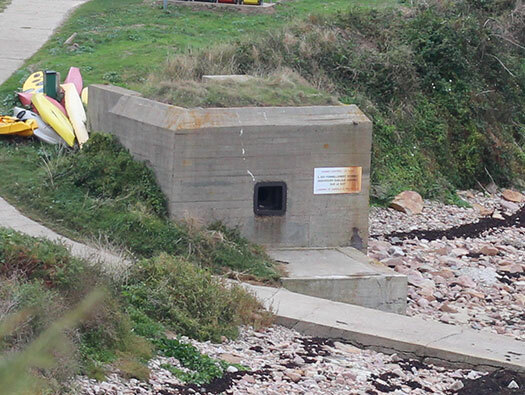 Close combat defence embrasure still with its wood surround and two large 200mm vents. They look like 200mm vents. Alderney, Wn Piratenschloss R631b entrance. The rusted Gittertür (Screen Door) which seems to be a different one to the 491P2 in that it has diagonal strengtheners. This is a Gittertür I found I think its Holland and this seems to be the same type. Alderney, Wn Piratenschloss R631b gas lock. 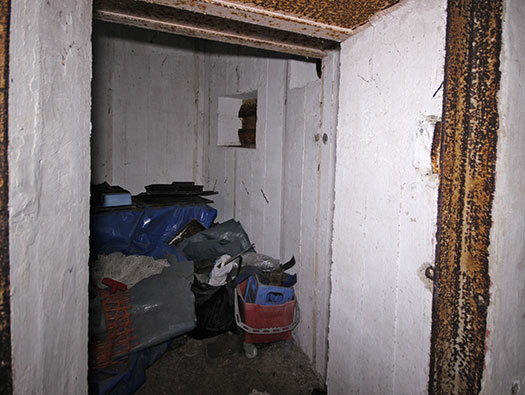 Alderney, Wn Piratenschloss R631b close combat defence room. 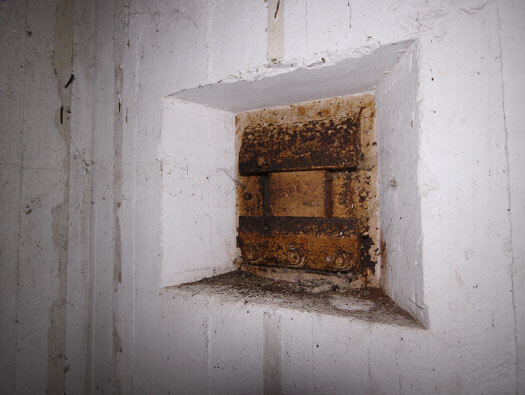 Close combat defence room with the embrasure. The door now missing should have been a 434P01 door. Close combat defence room with the 48P8 embrasure. Alderney, Wn Piratenschloss R631b crew room. The view from the gas lock through the crew to the gun room. 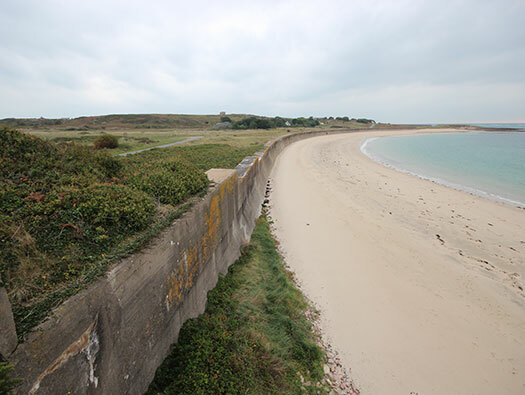 Radios were fitted into some bunkers but a secure cable network with armoured underground cables were laid and inter connected posts so that if a cable was cut another connection could be made via another cable. The red square there is a metal hook, its a door stop to stop the door from coming back on the connection box. Crew room where they slept, ate and worked. Bunks would have hinged down from the walls in three tears. Folded back in the daytime. A set of folding chairs and table and cupboards for all their personal kit. Floor level in the opposite wall is the escape hatch and above it is the close combat defence embrasure covering the entrance.. 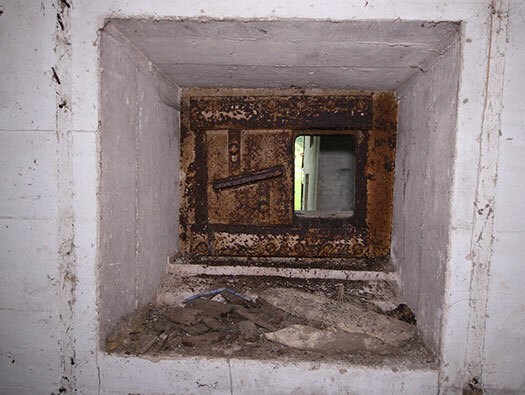 The escape passage just shows how thick the walls are, a 410P9 gas tight thin steel door would close it off and at the far end several shutters were placed in the far slots. 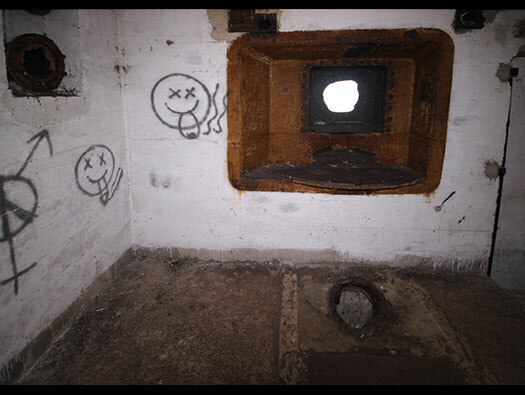 Crew room from the other way, door gas room, the next door to the gas lock and way out and then the close combat embrasure. 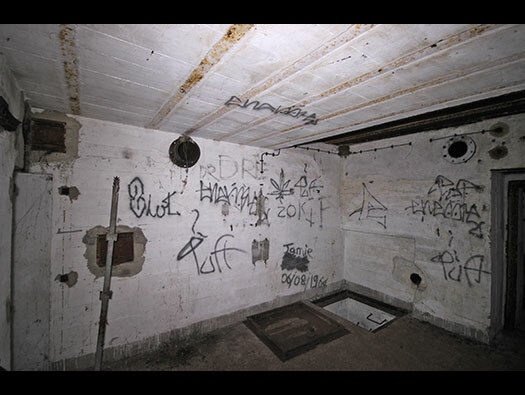 I believe the floor plan that I am using is slightly incorrect for this bunker. The gas room should be accessed via the gas lock but here it clearly is not, its connected directly to the crew room. Gas filtration by the main door. 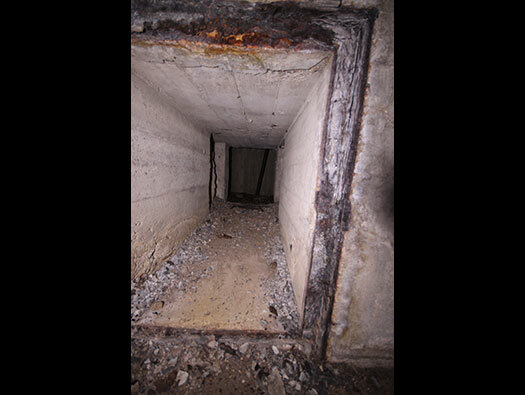 422P01 close combat embrasure covering the entrance. In the event of a gas attack, all doors would be closed and seals around the doors and a special paper/felt gasket. Then a gas filter drum fitted into the pump and air from outside sucked in through the filter and then filtered air slightly over pressured the bunker. That way gas could not get in. 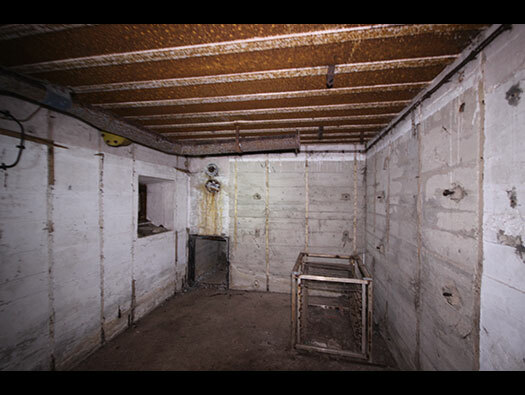 This small room was for I think two reasons, one for fresh air to be pumped into the gun room and the removal of foul gases from the gun room to the outside. It also looks as though these could be electrically operated or by hand. Anti-gas pump, Schutzlüftungsanlage delivers 2.4 meters per second of filtered air.. The square angle iron chassis bolted to the wall and carrying the pump. Alderney, Wn Piratenschloss R631b crew room gas pump. The oblong black mark on the wall is where the chassis bolted. Bei Gasgefaur Verbin - In case of gas. The original cabling looks as though it could go to the pump (so did they have an electric motor??). 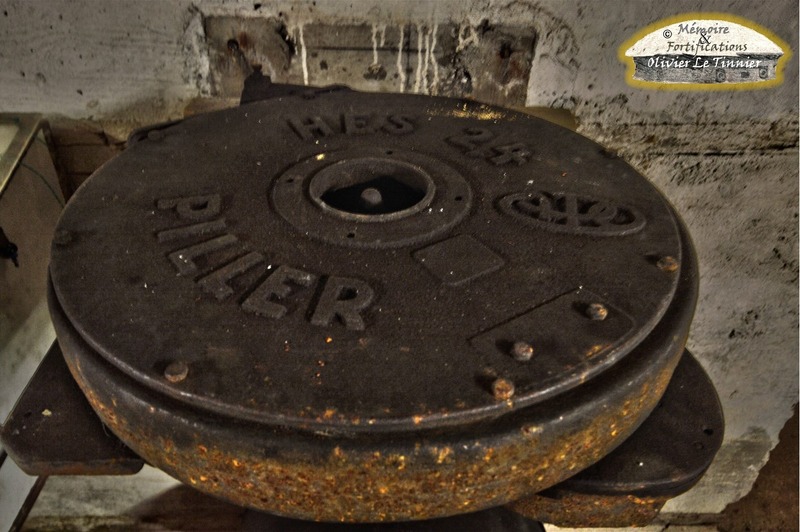 This is the gun room with the 770P4 plate for the Skoda 4.7cm Pak to locate into the ball and socket joint. The 770P4 plate has here been bolted onto the centre of this very large steel frame. The outer armoured door is risen or lowered by the handle on the right and the axle running across the top of the embrasure. 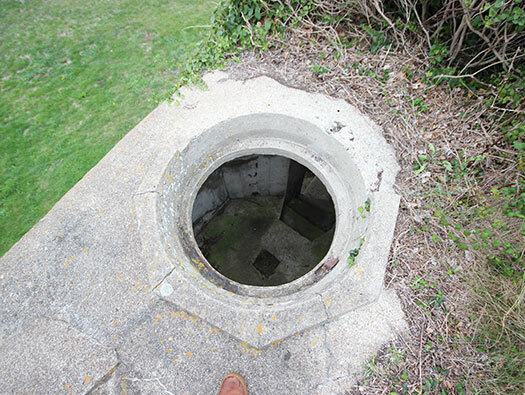 This hole is where spent ammunition shell cases went via a tube from the guns breach into the shell pit bellow the bunker. Route of the shell cases into the shell pit. 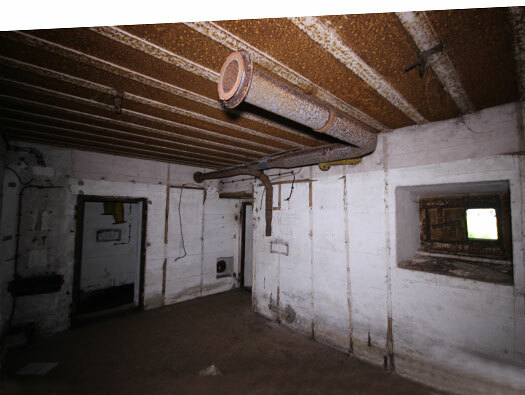 R631 showing the gun room, shell pit and steel shield. The guns ball & socket joint fitted into the main hole and the guns fittings into the swivel plate tray below. The gun was fitted to this ball joint. 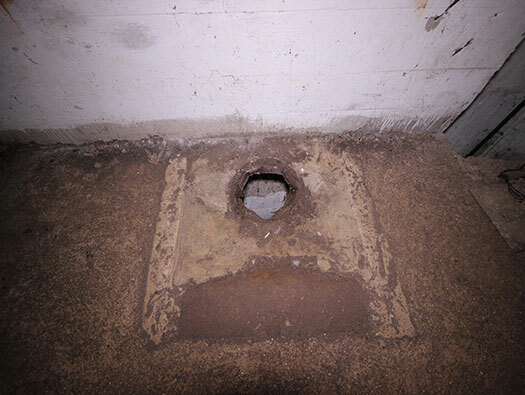 Gun room with man hole to the shell pit. 67P9 man hole cover. Shell pit with rather a large amount of steel steps down into it. 67P9 man hole cover is on the left. 4.7cm ammunition and carrying box. 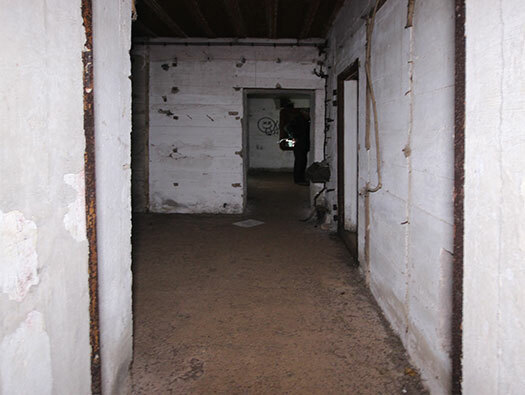 The opposite view to the crew room and the ammunition room. The pipes on the wall I believe are to remove the foul gases from the gun room when the gun fires. Ammunition room. A 19P7 thin steel door would have fitted here. The back of the anti tank wall with a fire step to shoot over the wall, very medieval. The top of the wall showing the fire step at the back and the work of art on the top!! 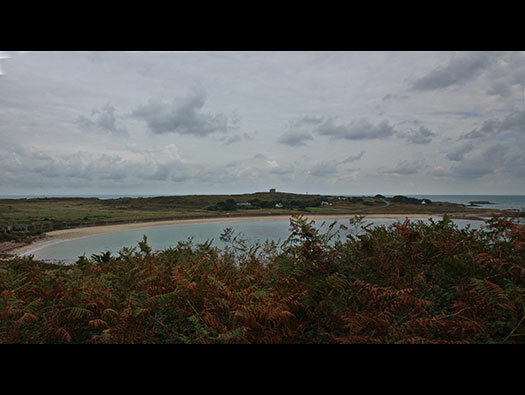 On the far hill is Fort Essex and below it Longis Lines. The field of fire from the top of the wall. 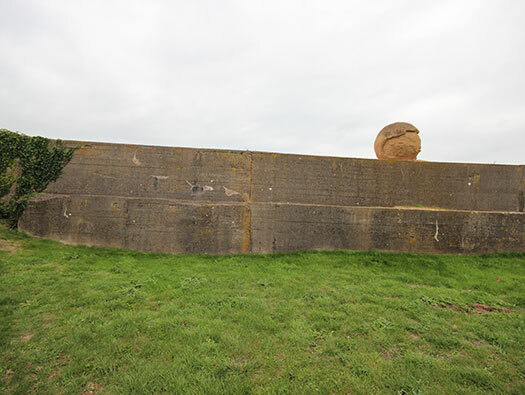 The front of the wall showing a flanking machine gun in the forts wall. Looking in the other direction and where the Skoda gun would have fired. Tobruk, defence machine gun, anti-aircraft and a fire control for the Skoda gun below. It could have used this type of machine gun fitting as the Tobruk has a hole in its floor for a square post to swivel the heavy machine gun. 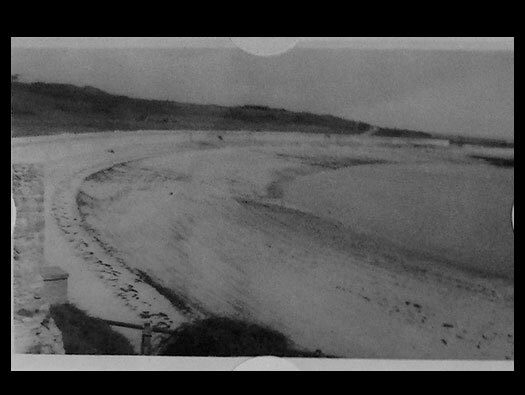 The same view in 1945.